An accurate, sensibly priced Adobe RGB monitor, that’s gorgeous to look at with great functionality, port technology and intuitive interface. They always say the best technology does not need you to read the manual, but with HDTV’s now containing more ports and buffers than most laptops, even computer monitors are becoming a handful. Benq is a company that has been quietly on the scene, alongside giants like NEC, Asus, HP and Eizo, offering a cost effective way of photographers editing images in the full Adobe RGB spectrum. Back in 2010 I bought an NEC 2690Wux2 for around £700. It has been the mainstay of my photographic processing for the last six years – the truth, if you like. Over the years, I have seen many different professional monitors, watching the technology get better and better, whist scratching my head about others. I am an avid MacBook Pro user, yet I also have an office PC that incorporates the NEC, so it’s been great to assess the same images on two entirely different systems for this review. After unpacking the Benq from its packaging, assembling the parts were straightforward and easy. The monitor comes with a weighty stand that guides into slots on the rear of the panel. There is also a screen shade, something I have only really seen with the Eizo range, so this was a welcome addition indeed. There are ports galore on the rear of the monitor, including a standard connections like DVI-D, HDMI and also the inclusion of a Display Port, something Mac and some PC users will welcome in particular. remember this isnt Mini Display Port, so you will need a MPD > DP convertor. I connected both my MacBook Pro and my recent review, the Microsoft Surface Book in the same way without software or drivers. The monitor comes with Pallette Master Element software for use with a colour calibrator like the renowned Spyder range. I have a Spyder Elite 3, which profiles dual display setups. Sadly this is not a supported device with this software as it requires at least v4 or 5, so I made use of my original Spyder software for the review. After setting the brightness to the correct levels, the calibrator worked its magic with the colours and made the necessary adjustments. The profile was saved and the computer restarted. With both my older NEC / PC and now Benq / Macbook connected to my QNAP photo server, it was easy to review images side by side. I was looking for any obvious disparities between the two, excessive colours / gamut, so with both profiled in the same way, with the same calibrator, I could get a reference on both for the first time. I have been using the Benq for over a month now and I have processed a range of images from the American Deserts to new work from Namibia and South Africa – I can report that it is a superb monitor. Firstly, the tones and colours express a linearity across the screen with great uniformity of colours. I always find that Adobe RGB monitors can express reds and oranges in a rather unsubtle way, but the Benq excels across the range, when any colours are dominant. Looking in detail at my NEC now makes me realise there is a yellowy slight aging occurring around the extreme edges of the screen, but after six long years this monitor is still doing well. A few questions that came to light were to do with maximum screen size. The Macbook Pro I am using is a 2015 model, capable of a maximum resolution of 2880px on the longest edge, which is 1440px at double the resolution, in retina. 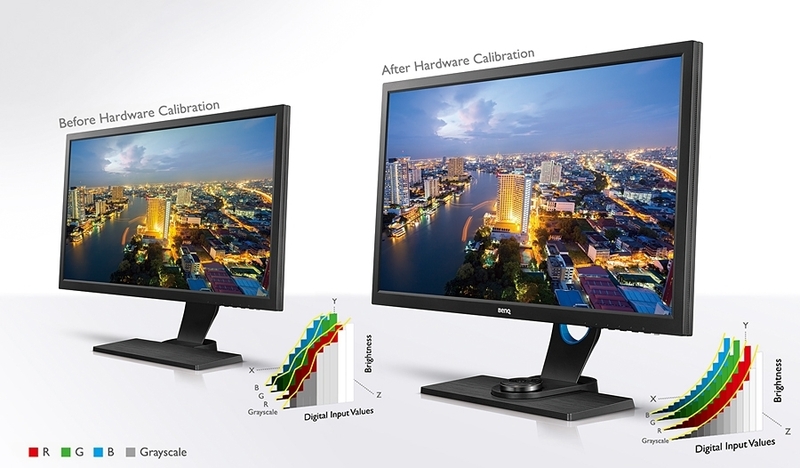 The problems lie with using the monitor in DVI-D or in HDMI. The Benq has a native screen size of 2560px so this means that the maximum resolution the Macbook can utilise is only 1920px in DVI-D mode. This makes the screen resolution seem a little soft, as I cannot run the screen at Native. Switch to HDMI and the maximum screen size is now 2560px, phew, but things look a little gritty, as once again the MacBook and the monitor are not operating at compatible resolutions. Sadly, there is no option for operating the monitor at half resolution, ie 1440px longest edge. So what I am concluding here is that every setting will not match the MacBook Pro, which doesn't make this a retina monitor. The System Preferences > Displays list (press the Alt / Option key and click on 'Scaled') contains 2560 x 1440, 2048 x 1152, 1600 x 1200, 1600 x 900, 1344 x 1008 and a host of other sizes that just make the text ridiuclously large. 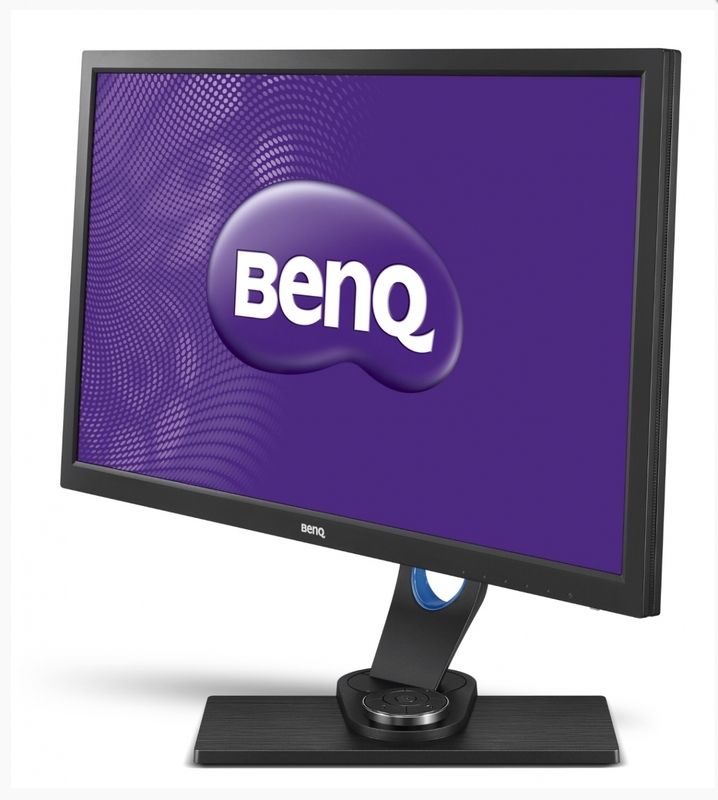 Devoid of the impeccable screen’s quality, the Benq is well constructed. My only gripe is that it uses cheaper plastic than I would have liked to see. The NEC is a marvel of higher quality plastics, a super smooth build to touch, whereas Benq have gone for a cheaper looking / feeling and albeit textured plastic finish. No doubt, this is where the price point beats a lot of its rivals, but on second thoughts, who cares; a monitor is not exactly something you ‘handle’ very regularly, so forget I even said that. Until you get used to handling it, the screen shade is a little tricky to mount. Expect its three sectionsto come apart as you work out how to attach it. It clicks together, slides into runners and attaches with velcro all at the same time. It holds well, but again you won't do this very often, so forget I said it. Finally, I should mention the OSD controller that comes included is very useful. I didn’t think it would be at first, but it’s a useful piece of hardware for changing settings on the monitor and navigating settings. A last point to include is that the button navigation in the bottom right hand corner of the screen, for navigating menus and settings, is very easy to use and intuitive. The NEC on the other hand leaves something to be desired. The Benq is working very well for me in my office as a monitor specifically for my MacBook Pro, for processing, email and all those regular applications. Although wide gamut doesn’t exactly need to be for everyday use, switching back to sRGB doesn’t exactly feel necessary either. I am a little dissapointed I cannot get the 2880px screen resolution, so I could run the screen at half native, 1440px retina. I find typing this article at 2560px to be difficult, I need bigger text, but sadly the screen resolutions cause interpolation problems that make text look blurry and shimmery. Although an adequate build quality, its what’s under the bonnet that counts and the Benq delivers where it counts, as a fabulous screen for processing pictures, just remember to zoom in significantly, or you wont see any dust spots at all! 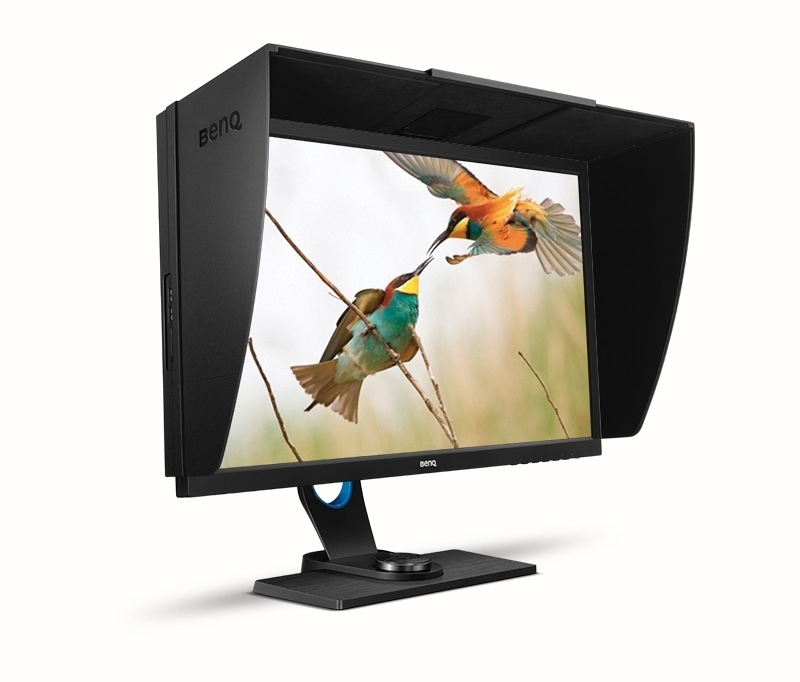 The Benq 2700PT will appeal to those looking for exactly what it is – a quality photo monitor at a great price.